Do you have a ‘life verse’ from the Bible? Do you remember when it appeared to you and what circumstances you were going through when you received it? What an alarming moment that became, and for most of us who experienced it have never forgotten it. It’s good when the Holy Spirit brings your memory back to that “Egypt and Moses and Red Sea” experience in our lives and when we really need to be reminded and refreshed by it. I remember for me, it was unexpected, and yet things around my life at that point seemed so much ‘out of control’. All I could do was to try and hold on to what I had, and what I had, the tighter I held it in my hand, the more it began to look like sand slipping out of my hands. There was nothing more I could, and God knew it. Whether I knew it or not, things had to change; and the only way for that to happen was to clean out the old and bring in the new. Easier said than done however. I don’t think there is anyone of us who can stand and say they he had anything to do with what only could do, as He was calling on us to do just one thing, trust Him. As a child trust a parent, God was going to make His presence known by what He alone was able to do; taking us through areas in our lives that we would never travel alone. He promises us here that He will be with us in it all, He would faithfully complete the work He began when He ‘formed’ us, and while we were “yet in our mother’s womb”. Don’t you see that God has “chosen and known us before the foundations of time?” It blows me away, because when you sit down and think about it; what do yo have that you can say is good, and fruitful, and growing despite yourself? God’s chosen people were people like us, we wanted a new liberty, but we didn’t know quite how to arrive to it and yet that is when God appeared in what was probably for them at their lowest points. They were a people without a Name. A people without a purpose. And yet God would choose the “foolish things in the world to confound the wise”. Their eyes would need to be wide opened in fantastic miracles, like the parting of the Red Sea and the protection God would give, and revealing His power and authority over all things, including nature. Sadly these chosen would use this miracle as their “barometer” for how to keep using God for their own needs. They were walking by “sight and not by faith”. And so God brought them time and again into difficult paths that would enable them an opportunity to trust God in that path, knowing that the neither the waters, rivers, fires of this life would never hurt or overwhelm them as long as they trusted and believed Him to His Word, He is their God. God desires a personal relationship with all of us, and yet the most succesfull ways would always come through some kind of adversity or trial. Look around your own life and see if you can spot someone going through something that not only touches but breaks our hearts. God uses this opportunity, not only for the one going through the rivers, or walking through the fires, but for those standing by. Most times either we don’t know how to react to someone ‘passing from a stream to a river’ or “walking through a fire, seeing the ceiling appearing to be caving in on their lives. God has given us an open door through His Son, Jesus Christ where we can come anytime to be reminded over and over again just how much He loves us and loves those in your life who are passing through waters and rivers and fires, that He alone can save and transform your life immediately! God uses prayer as a way for us to get up close with Him and tell Him anything, there is nothing too embarrassing for Him. I remember an old Gospel song that sang about Daniel’s Den about prayer. The man singing it said that “Prayer changes everything……. Prayer even changed the appetite in those lions that night, until the morning that the king could see for himself that the God of Daniel truly is the greatest! He can do anything! Maybe today you are facing challenges and difficulties that seem out of control, why don’t you get refocused and pray, and seek God to maybe, take you back to that first time, when you know you heard Him, and when you gave it all up and entrusted Him with all rivers, and fires, and saw how He ‘calmed the raging seas’ and ‘calmed the waters’? He is still my God, He is still saving me, and for that I am ever reminded while in and through my trials. Today I received some ‘good news’ about my journey through the waters, and rivers, and through the refining fire. God is with me, and He has been faithful in all His promises to me. My doctor shared with Patty and I that everything from my C scan as well as other reports off that, say that I am well. I especially took note when he referred to it as a “benchmark’ . I have only two more sessions in chemo and then, I will be finished. In closing, the question arises maybe for you today, have you remembered where God brought you from? 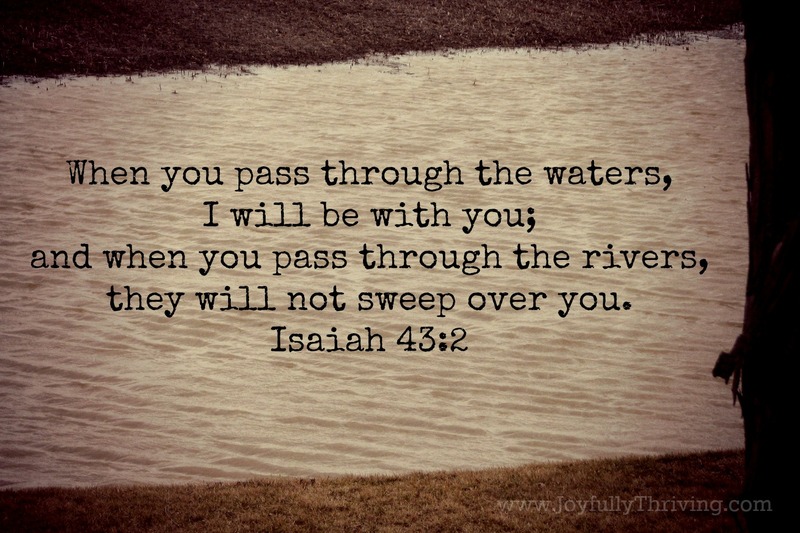 Do you remember those words God spoke to you personally, to rescue and deliver you from your calamity? If not, go back and read it again, you might be surprised that His Word, His promise to you has never changed.